Hey guys! 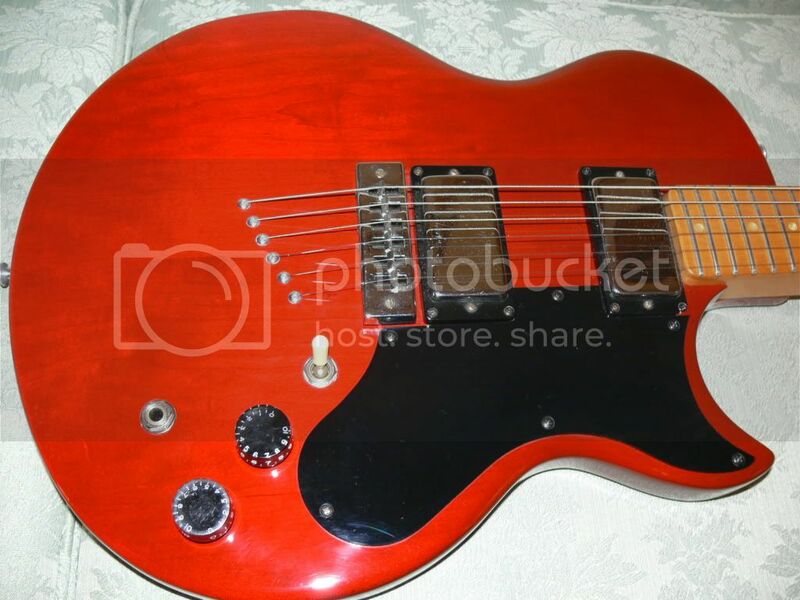 I've been scouring the internet for a bridge for my Gibson L6-S. Everywhere I've read says its a nashville style tune-o-matic bridge but when looking at pictures of the standard nashville style bridge, it looks NOTHING like the real L6-S bridge. The one I need is very wide. the bridge has started to rust up due to lots of use and sweat. if anyone can tell me if they know exactly what type of bridge this is, and possibly where to find one, I would be greatly appreciated.. 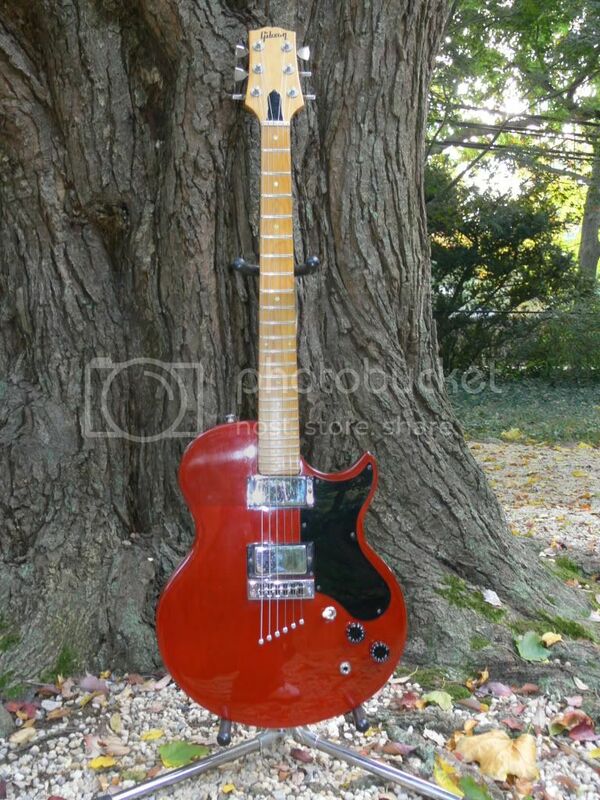 I would LOVE to restore this guitar with some new hardware and electronics. ebay? It's sometimes called a harmonica bridge. What kind of pick-ups are those? excellent! i believe you are correct! thanks so much. been looking everywhere for one of these. as far as the pickups, they are original P90's with the all chrome cover. excellent sound..
Stock on the L6-S were Bill Lawrence humbuckers, hot pups without adjustable poles. I was going to try and pick one up myself but they got super expensive in the last 3 years or so. interesting to know about the Bill Lawrence pickups. I never knew the correct answer to that question. I had an old buddy tell me they were P90's. But I tell you what, they are the best damn sounding pickups I've ever played. The L6s was designed by Bill Lawrence including the special pickups, and those ones look right for the L6S Custom. P90s are a different size and shape, and even when covered, have visible adjustable pole pieces. A Japan company -- who would have thunk it?? Now first did ya try Gibson for the bridge? I have had good luck in the past getting the parts I needed for my L6-S from them. 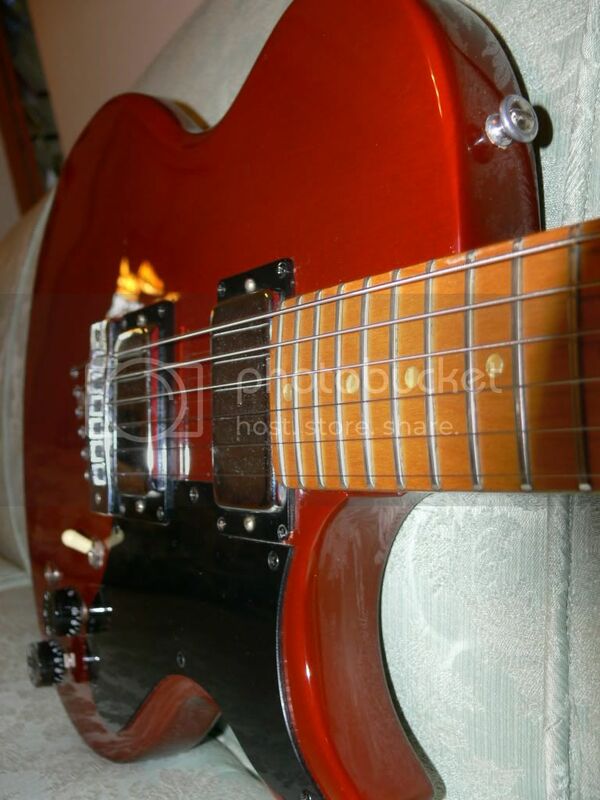 It was many years ago I bought a new plastic pick up holder ring from Gibson for my L6-S. It was reasonable in price and the delivery was not bad either. Got it through my local music shop too boot! You will see the Guitar Bridges and Tailpieces section to click on. I did go to it and man to they have a chit load of bridges in there. I did not go through them all but it may be in there and I bet if you send them an email and pic of the L6-S they will be able to ID it for you and help you buy one from a distributor here in the good olde USA. Let us know here how you do in your quest --- Naturally I am interested myself to see how you do since I may very well be in the same jam for these parts some day. In fact I could use a set of 6 of the small parts where the string touches the adjustable bridge part since mine have worn over the years and a small burr forms and it takes out the skinny e string on me -- premature failure often long before the string should let go. We wonder if you can buy the only the contact block metal part by itself -- you might ask this this as a favor for me if you do end up contacting them -- maybe they only offer the whole bridge perhaps? This is my first post at the Gibson forum for me --- I do some posting on the Orange Amp forum and a few other music forums we check out every so often. I bought my L6-S right after the great blizzard of 1979 in Chicago with money made from snowplowing and have never found a good reason to buy another guitar since the L6-S did every sound I ever wanted to make. Just like Carlos said it is truly a "rainbow of sound" -- Bill Lawrence did a great job on the pick ups and the electronics -- BTW Bill has a great website ( http://www.billlawrence.com/ ) with a lot of good info on mag P/U's worth checking out not to mention the history on the man. Quite a fellow that Bill is no doubt. He is still making them at 77 years young-- there is even a u-tube vid of him on a Fender at the NAMM show. I have always been a Gibson Man but I do have to admit I would not mind someday to buy a Strat just to have one for kicks and Grins --- but I would really love to buy that new Gibson Sig- Les Paul Jimmy Page guitar no doubt!!! I have to say that part looks very close -- Maybe this company could get one for you exp. if you let them know you think it is a GOTOH bridge! I am in the finishing stages of an L6 Midnight special restoration. I disassembled the guitar some 18 years ago and have lost the bridge and posts. I have purchased a replacement bridge (harmonica style) but the posts are too wide for the original anchors. So far this has been a mystery because I have talked with a few luthiers and they don’t get ether. The original L6 bridge’s were made by Schaller but for some reason I have an oddball. The parts I lost were original and looked the same but for some reason the posts are smaller. Can someone offer some insight on this? Well thanks for the insight on Schaller being the OEM for the L6-S Custom guitar hardware! It looks like you could actually email Schaller and they might answer any questions on the Gibson "L6-S Custom" guitar hardware parts. The Schaller website is very nice and it does look like they very well may be the OEM of the original L6-S Custom parts. Makes more sense than the Japan company "Gotoh" that I found but had not confirmed. BTW how did you confirm that Schaller was the OEM at least on the L6-S Custom Hardware? Was it Gibson who told you or just through the grapevine? Or was it Schaller that helped answer this? Did you ever call Gibson on your "Midnight Special" and ask about the OEM of your parts? Any other of you forum members have insight on the parts for the various L6-S models and who were the hardware OEMS of the components? Any one try Gibson direct lately? Are they helpful? It would be nice to have this thread become the "Go To" reference source on these questions for the various models of the L6-S. I always knew it was a Schaller from reseasrch in the past and Gibson did confirm this. It is called the "Wide Travel" by Schaller. I think they were used on SG's, Marauder's and who knows what else. I have called Gibson about my Midnight Special and they were no help as usuall. They were nice about it though. Also I wrote to Schaller and asked them about my odd ball size on my Wide Travel and they wrote back and asked for a picture. Well I sent them the picture and they wrote "we are not sure if we ever made that bridge and we wouldn't have parts for it anyway, but you can try browsing our products catalogue and maybe you could find a new one that will work"
They could not be any more useless! So I'm back to square one, trying to find a 7mm bridge stud. I have seen them in 8mm's and even in 6mm's but of course mine has to be the weird one. Nothings ever easy! Waitaminute! XP29, you say you need 7mm bridge studs, but that's the size modern Nashville tune-a-matics use. Unless the spacing of your stud holes is completely different (2.93" or 74.42mm, center to center), you should be able to use Nashville type studs with the wide travel bridge. No they won't, the head is too long and narrow which would make the bridge move around. (Won't lock into place) Thanks anyway. The L6 is finished, how the hell do you upload a pic on this site? It may be a bit tricky to do but you have to get it between the two of them. Then hit preview to see if you have it right. We will look fwd to see how it has turned out ~~ Does it play well now? Is the action nice and the bridge steady now? It plays very well, the pick ups are awesome. The neck has a bit of a back bow from being without strings for many years so it has a slight buzz on the upper frets but nothing worse then a typical strat. All and all I'm very happy with it, it's not perfect but I have yet to find a guitar that is. The pics don't do it justice, it looks really good. Oh by the way, the sleeves for the post were tapped out for the 5/16 posts and the bridge funtions as designed. Very Nice -- Glad to see it has all worked out for you. We will post your pix -- all you have to do is click on the IMG Code and copy/paste em in the text box here -- Photobucket does the IMG brackets automatically for you! That is why I like photobucket for pix the best! !